Howard University held their 2018 Athletic Hall of Fame Induction Ceremony recently at the Martin's Crosswinds in Washington, D.C.
Sixteen former athletes, administrators, three teams including one involving Former Premier Dr. Ewart Brown and five Buffalo Soldier Award recipients will be inducted for contributions to the athletics program. Bison Express, the official alumni support organization of Howard University athletics, sponsors this recurring event. 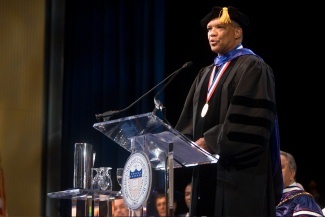 Dr. Brown was a member of the Howard University’s 1968 Track Team that had coach Dr. Wilmer Johnson.